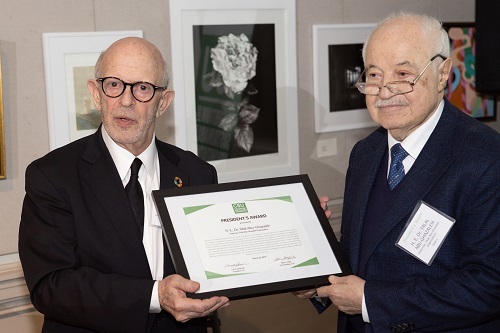 New York- HE Dr. Talal Abu-Ghazaleh, Chairman of Talal Abu-Ghazaleh Global (TAG-Global), was honored with the prestigious President's Award in the sold out Inaugural Awards Gala for the Consortium for Sustainable Urbanization (CSU), for his creativity and innovations in the information, communication technology, and his universally recognized initiative in the protection of Intellectual Property Rights and for his influence on how we plan, design and manage our cities. 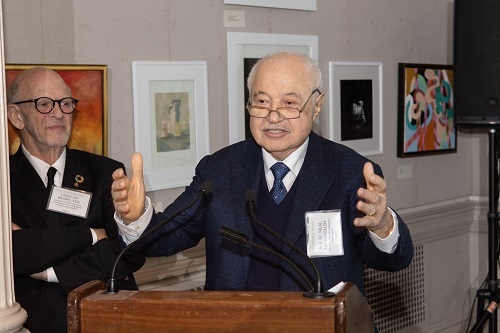 Dr. Abu-Ghazaleh, Chair of the CSU Honorary Council, a New York based non-for-profit organization, accredited by the UN Economic and Social Council (ECOSOC) was also recognized for his "vision on the Internet and its role in shaping the cities and create smart cities resulted in his being the founder of the Global Alliance for Information Communication Technologies and Network 11 and will continue to guide future partnerships." His strong passion can be best measured in the pages of his latest book entitled “The Brave Knowledge World” which introduces his lifelong vision and philosophy relating to the Knowledge Revolution and its impact on the future of humanity through his experience as chair of the UN ICT Task force and UN Global Alliance for ICT for development. At the Award special ceremony held at the Century Association in New York City and attended by HE Ms. Maimunah Mohd Sharif, United Nations Under-Secretary-General and Executive Director of UN-Habitat and Lance Jay Brown, FAIA, President of CSU and renowned design professionals in New York, governments, UN representatives, NGOs and academics, Dr. Abu-Ghazaleh said: "The honor of being part of the CSU's mission is really something that cannot be measured and being honored by the CSU's leadership is in my opinion the highest recognition a person can receive in his life; thank you CSU for all the effort and support to our cities and most of all thank you bringing the design community, the general public and the United Nations together for the benefit of societies around the world." "But there is not time to rest. The cities of the world need us to achieve the Sustainable Development Goal (SDG) 11 “Make cities and human settlements inclusive, safe, resilient and sustainable” and that is why we still have so many things to work on and I place the expertise and our 110+ offices around the world in the service of our goal," he added. The award citation for Dr. Abu-Ghazaleh read: "We honor HE Dr. Talal Abu-Ghazaleh for his strong partnership with UN Habitat and his leadership and support of the Consortium for Sustainable Urbanization, his creativity and innovations in the information, communication technology, his universally recognized initiative in the protection of Intellectual Property Rights. His vision on Internet and its role in shaping the cities and create smart cities resulted in his being the founder of the Global Alliance for Information Communication Technologies and Network 11 and will continue to guide future partnerships. "